The new decal was created to mark the occasion of Real Madrid’s charter flight on an Emirates A380 from Madrid to Abu Dhabi today, where the team in their capacity as current European champions will compete with football club champions from other continents. 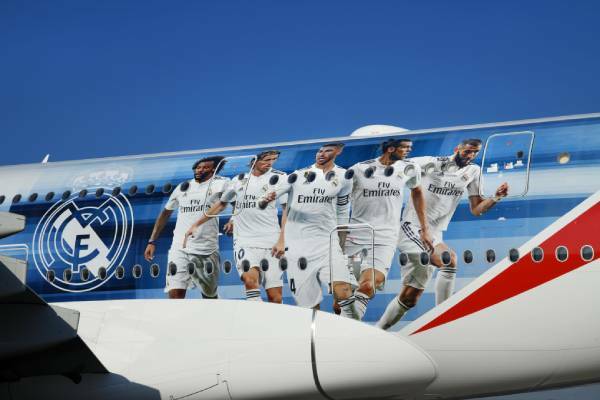 The bespoke decal features first team players Marcelo, Luka Modrić, Sergio Ramos, Gareth Bale and Karim Benzema, and covers over 200 -sq-m on each side of the double decker aircraft. Decals featuring Real Madrid players first appeared on an Emirates A380 in 2015, and has since become an eye-catching representation of the airline’s association with the club. Emirates has been the Official Main Sponsor of Real Madrid since 2013 with Fly Emirates branding prominently displayed on the players’ kits. The decal will remain on the aircraft for six months and fans can catch the aircraft as it traverses the globe with scheduled services planned to Washington, Nice, Mauritius, London Gatwick and Sao Paulo.